The joy of designing a new type of ring, bracelet, or any important jewellery, presents the challenge of solving the unique puzzle that each piece represents. Ring of Circles is a fine example of such a design puzzle. 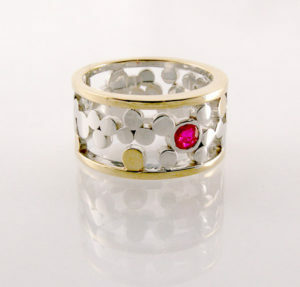 The ring's structure is made of discs and circles of two tone gold. Two colour tones of gold and the use of negative space presents a challenge when casting, forging and polishing this stunning ring. The outcome is worth the effort! Do not allow the Ring of Circles' playfulness deceive you, for in its beauty there is a strong and durable structure. The addition of the passion-red ruby shown in the image is firmly set. You may personalise your Ring of Circles with your choice of precious stone. We know this ring makes an extraordinary birthday gift when matched with your loved one's birthstone or better, a brilliantly cut diamond. Like what you See? Make an appointment with us, we would love to hear from you.